The prosperous Kingdom of Greengully, ruled for centuries by the Forever King, has issued a decree to its citizens to colonize the vast lands beyond its borders. 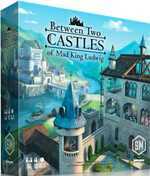 In an effort to start a new village, the Forever King has selected 6 citizens for the task, each of whom has a unique set of skills they use to build their charter. In Charterstone, a competitive legacy game scaled for 1-6 players, you construct buildings and inhabit a shared village. Building stickers are removed from cards and permanently added to your charter on the board, becoming action spaces for any player to use (kind of like Lords of Waterdeep and Caylus). Thus, a few available buildings soon grow into a bustling village with dozens of actions. Your journey through Charterstone?s many secrets will last 12 games, but it doesn?t end there. Your completed village will be a one-of-a-kind, variable worker-placement game. It is completely optional as Charterstone is designed to be infinitely replayable after the first twelve-game legacy campaign. The back side of the game board (included in the core game) is used for the second campaign. It contains all components that were permanently changed in the first campaign while allowing players to use unchanged components like wooden resources, meeples, and metal coins. Scythe Encounters is a boxed set of 32 brand-new promo encounter cards. These cards feature a number of innovations in the encounter system. You can play with them on their own for a few games to learn these new mechanisms; after that you can shuffle them into the regular encounter deck. 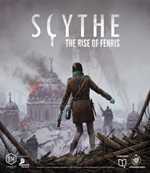 [Campaign (8 games): The story of Scythe continues and concludes with an 8-episode campaign. While the campaign includes surprises, unlocks, and persistent elements, it is fully resettable and replayable. [Modular (11 modules): Instead of?or after?the campaign, the new modules in The Rise of Fenris can be used in various combinations to cater to player preferences. 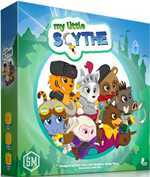 These modules are compatible with all Scythe expansions, and they include a fully cooperative module that isn?t part of the competitive campaign. The box features a dual-layered bottom half and a top that is the exact same dimensions as all other Scythe tops, allowing backers and fans of the original top to use it interchangeably with the new top. While the Legendary Box does not include any game components, it contains 3 large tuckboxes to fill unused space (and, optionally, store tokens, cards, and other loose pieces). The latest printing also includes structural supports. Because the Legendary Box has the same length and width of all other Scythe boxes, any custom insert fits perfectly inside of it. However, it?s double the height of the original Scythe box, adding much more room. The Legendary Box features the following: 1 giant box (300x365x196mm), 3 tuckboxes (70x289x118mm), 2 spacers to protect the integrity of the box and the tuckboxes during shipping. The Viticulture Essential Upgrade Pack turns a Second-Edition copy of Viticulture into the Essential Edition. It includes 154 illustrated cards and 1 rulebook. These components are also included in the original Tuscany expansion pack. These 72 thick metal lira coins, originally designed and used in Tuscany Prima, fit into any Euro game. There are 36 copper-colored 1-lira coins, 24 silver-colored 2-lira coins, and 12 gold-colored 5-lira coins.